I decided to take a break from putting my Christmas list together to write this report! 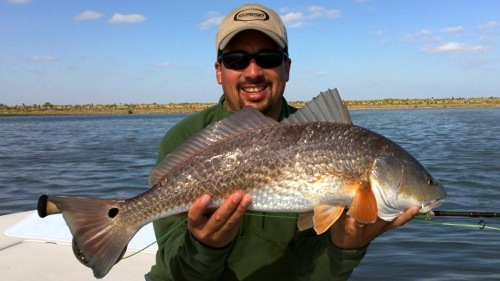 Another year is about to end here on the Lower Laguna Madre and I must say, “what a year!” The fishing has been phenomenal despite a bout of red tide and gallons of fresh water in our bay from Hurricane Alex. These curves Mother Nature dished out at times had us scratching our heads, but the bounties were there for the taking. It made the prize all the more satisfying. I will say that November and December fishing has made up for all the trying times! Trout have really begun to show the benefits of a five fish bag limit; although, they remain ever elusive targets on the fly! 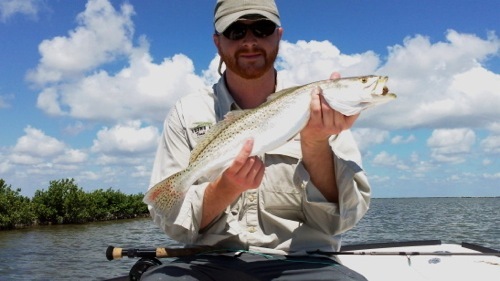 On a recent trip, Jeff King of La Feria, Texas, managed to roll cast his fly to a trout sitting on a grass flat just 10-15 feet from the boat! It was one of those situations where all the planets aligned and everything clicked! Those of you that do it on the fly know that making a short cast with almost no line out is tough enough. Let alone making the cast to a pesky trout! The take happened in gin clear water, and watching the trout’s gills flare as she turned to inhale the fly made Jeff’s face look like he stepped on a rusty nail – his mouth wide open and no sound coming out. Fishing for these big trout can be addictive. However, leaving the sure fired action of feisty redfish often proves difficult for fisherman on the bow of my Maverick HPX-T. The shear number of redfish we have caught over the last 4 or 5 trips is staggering. Having 20 fish days have been the rule rather than the exception it seems. Tying fly patterns with varying sink rates and colors are the key. 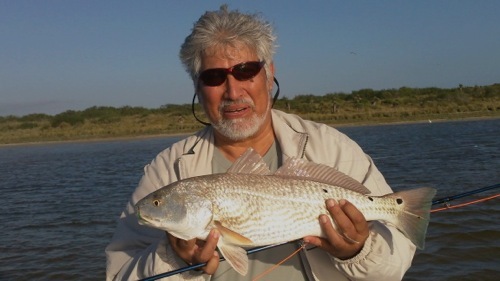 Getting out on a windy morning to fish in the Lower Laguna Madre Fly Tyers Club proved this point to my guest for the day, Dr. Rey Ramirez (the club’s founder). After presenting his fly to what I knew were a couple feeding redfish with no results, I asked Rey to tie on a different fly in his box. The next cast to another redfish rendered an aggressive take! Knowing which pattern would get down to fish’s strike zone was all it took. Having the right equipment as well as having it in good working order is the key to a successful trip. Friend and fellow Capt. Bryan Robinson and I use off days to get out and try new equipment. Just yesterday, we went out to put a new Redington RS4 8wt. entry level outfit through the paces and it did not disappoint. Besides having a smooth drag system and great casting action it just looks amazing! Here is a picture of the refish that helped test the setup (just shy of eight pounds and 27 inches long). If you have not made your Christmas list yet make sure to add this outfit. Send me an email at [email protected] for the details. If you have not made it down to our neck of the woods, I will ask you to think long and hard about coming down and hopping aboard with me. We are sure to have a blast. Subscribe to my Youtube channel for videos of recent trips: http://www.youtube.com/user/TheFlatsGuide or become my fan at http://www.facebook.com/home.php?#!/FlatsGuide to post pictures of your recent catch. Now back to getting my wish list ready for Santa Claus! Happy Holidays to all and may the New Year find you with the equipment and skills for landing that trophy fish! Man, those fish are fat! Is that winter weight or what?